But we dogs are about to let you in a little secret. Okay, a lot of secrets. We graduated first in our obedience class three times. This should tell you something. Puppies know that they're being cute. They're using you. We don't sound anything like those silly voices you use to imitate us. We hate those ridiculous names you give some of us. Moonbeam is not a dignified name for a mutt. You might want to check your herb garden for fertilizer. We are only wearing this stupid birthday hat so we can get some cake. No self-respecting dog cares about his birthday. We are not spoiled, certainly not in comparison to teenage girls. We are in charge of the house. We let you pretend that you are. We'd be lost without you. We love you. Kritters Thoughts: First, what a cute concept! There are many times when I am spending time with our pup Charlotte and I am just wondering what is going on in her mind. Often I wonder why she does certain things and what she thinks about me and our life. I chuckled often reading the stories from these different dogs and the issues they had with their humans. With 11 different dogs sharing notes addressed to their human counterparts about different things, it was funny to read about different breeds and their owners and home lives. Each dog had different stories to share and were all entertaining. 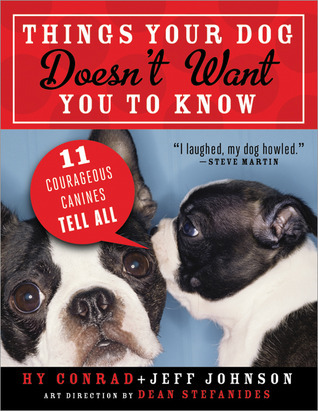 I think this is the perfect gift book for the friend you have that is a dog person. I will be passing my copy along to my cousin and her pup Harley. Thank you so much for reviewing my new book, "Things Your Dog Doesn't Want You to Know." And I'm thrilled you want a sequel (I hope my publisher does too)! What a fun book! My husband, son, and I are total dog people so I know this would go over well in our house.